Sleeping mat is normaly spoken out loud in combination with an expletive in this house. Mats are the one bit of kit I don't seem to be able to get right(should I be taking the blame or shoudl teh gear manufacturers?). Things being what they are, all kit is a compromise. A balancing of functionality, weight, durability, bulk, cost and, sometimes, comfort. Somehow I don't seem to be able to find an equilibruim in the case of mats. I've got more mats stacked up in my garage than you'd find in the average turkish bazar. All of them irritate me in some way. Three years ago, with the purchase of an Exped downmat 7 short I thought I'd found a lasting solution. It's a superb bit of kit. Yes, at 695g inlcluding stuffsack it's a little on the heavy side but its supremely comfortable and the insulation will take you right through the year. All the mat you could ever need right? Well as it happens, in my case, no. Appart from the fact that I have to lugg a 100g of badly- funtioning-pump/overweight-stuff sack around I end up fretting about the condition of the down. After three years of use is it still insulating as well as it should? On balance I found I could live with these things but then I made that all too familiar blunder; I changed another part of my sleeping system. After retiring my prehistoric Pheonix Bivvy bag I invested in an MLD alpine bivvy. A wonderful piece of gear half the weight of its predecessor but, annoyingly, even in the extra large size, it tapers just too accutely to comfortably accomodate the down mat without squeezing the life out of my sleeping bag. You win some you loose some. Then came the Alpkit Wee Airic. Good reviews and a miserly streak made this a purchase I couldn't resist. How many times had I stood in the shop with a prolite 3 in my hand and then, at the last minute, put it back on the shelf? More than you could count on on your fingers and toes I expect. Surprisingly, considering I'm the Imelda Marcos of sleeping mats, I just couldn't bring myself to shell out so much green for 1970's technology. The patent had, after all, long since lapsed and the cheap imitations were as good, well almost, weren't they? 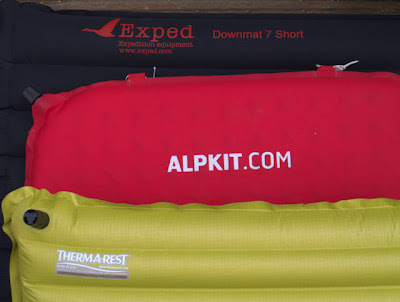 The Alpkit mat, although a return to self-inflatables, seemed like it could fill a hole. Wee-Airic for fast and light and the Exped for car camps and cold conditions. Sound logic. However, cold logic rarely holds true, chaos rules. The Wee-Airic, wee as he already was, had a nasty habbit of self-deflating part way through the night. Compatable with my bivvy bag but not conducive to a good nights sleep. 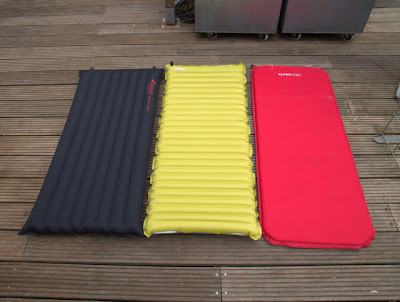 Given my obsessive compulsive relationship with sleeping mats its hardly surprising that I got sucked in by all the hype surrounding the release of the NeoAir. I've been fixated on them since I first read of them in Chris Townsends review in the February TGO. True at 6.5cm the Neo-Air might be just as incompatable with my Bivvy bag as the 7cm Exped but, tipping the scales at just 260g, it should get a royal pardon for any evils it commits right? Then there's the fact that, by all accounts, it's a wee bit thinner and a wee bit narrower than the exped. It could just work right? Sit long enough with one in your shopping basket and your finger twitching over the right click and self denial is bound to kick in. Accordingly my shiny new Neo-Air arrived in the post yesterday (complete with bag of skittles courtesy of Bob and Rose). First impressions: Looks great. Far more NASA than Fair Trade Shop. The boy in me likes the flash-gordon feel that hangs about the product. I also value thoughtful design. The silvered base sticks like glue to the wooden floor of my living room. Nice because I don't expect to find myslef slip-slidin away in the middle of the night on this thing and reasuring in that its suggestive of many hours spent tweaking and adjusting to get things just right. As far as mats go I confess to placing comfort high on my list of priorities. Foam mats havn't featured in my kit list for many years. As you'd expect at 6.5cm comfort abounds. Ten good lung fulls of air gets the NeoAir nicely up to pressure and when kneeling on it my knees don't feel the ground. That's not the case with the Exped. Altough slightly thicker you can't get it pumped up quite so hard with the stuff sack. It feels slightly less stable than the Exped. That may have something to do with the orientation of the tubes, the fact that the outer tubes on teh exped are slightly larger in diameter or that the Exped doesn't inflate so hard but for whatever reason the NeoAir feels a little more like a ride at sea. However, such things need time to evaluate properly. As for the numbers: Mine is 258g without stuffsack. That's two grams shy of the claimed weight. I will be eternaly greatful to Thermarest for their honesty and accuracy. 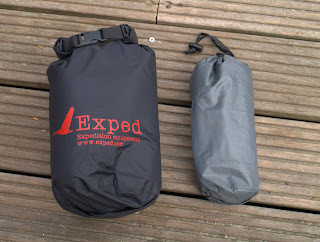 Although I've read otherwise it seems to me that the NeoAir is the same width as the Exped. At least, if it is narrower, the difference is insignificant. Similarly the difference in thickness is not imediately apparent. All good news for comfort but probably bad news for my bivvy set-up. Packed, its the smallest concievable package of good-nights-sleep. I've not yet tried putting the Neo air in my bivvy bag. I want to enjoy it some more before confirming the bad news. My guess is the NeoAir will not be for bivvys or, alternatively, the purchase of another bivvy bag may be hiding around the corner (oh oh!). If the NeoAir proves to be everything it promisses then I'will be tempted to build the rest of my system around it. Finally, they say all good ultralight gear should be multifunctional. I'm sure Emily would agree that the NeoAir pushes all the buttons. You dont know how many I have of these mats! And I've just taken delivery of a NeoAir, talk about the prince and the pea. Baz: I'll hazard a guess at the same numder I have. Willem-Maarten: Jou bivakzak past, denk ik, precies om mijn mat heen! 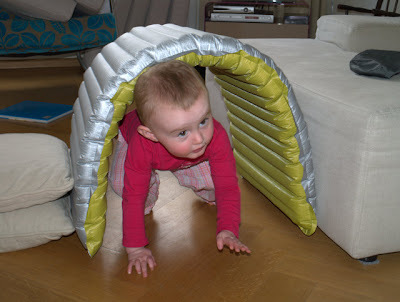 I too am a fussy bugger when it comes to sleeping mats but seem to have struck gold with the Neoair - love it. 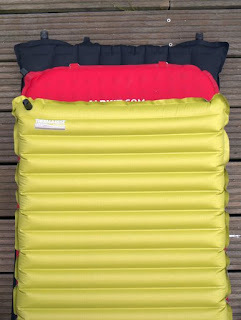 I have a Fatairic from Alpkit for car camping and too have a problem with it deflating during the night, a common problem with their mats? Good to hear you like the Neoair. I've got high hopes for it. Can't see there being any issues other than durability. As for deflatng Airics: I can't comment on how common the problem is, I've only owned one alpkit mat. Nor am I likely to find out since I'm sticking at one. Not noticed any consistent criticism on the web fora though.